Line drawings today are usually done on a computer using a software package that already exists. This article is for people who would prefer to write a new program to draw a particular thing. If the program reads an input data file with dimensions and proportions of what they wish to draw, it will be easy to re-draw it with different dimensions and proportions. 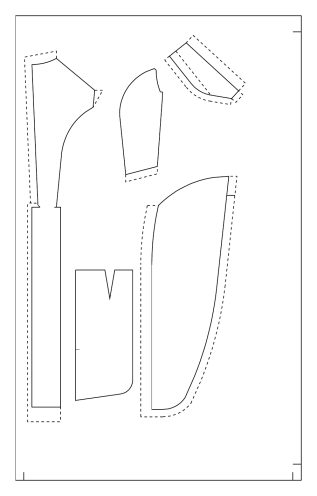 The following set of line drawings was produced by a single program that used the software tools presented in this article. Source code for a drawing program is provided at the end of this article. You will have to add source code to the program to draw whatever you want to draw. You will be able to see your drawing on the computer screen, to print your drawing at small scale on your printer, or to put your drawing in a web site. You can scale up your drawing to large scale, convert it to a pdf file, put it on a USB stick, and have a shop with a very large printer print it at large size. Such a shop might be called a blueprint shop, a reproduction shop or a graphics shop. 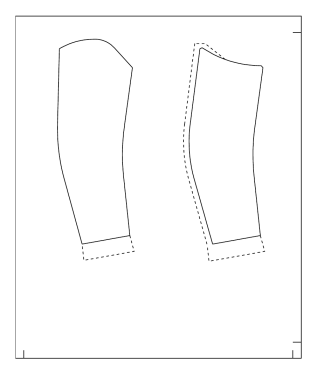 You must draw a rectangular border around your figure to print it out on a large printer. The border tells the printer where to automatically cut the paper. Before the age of computers line drawings of machine parts, clothing patterns, etc. were drawn by hand by a draftsman using a straight edge to draw straight lines and compasses to draw arcs. He used large and small compasses and dividers, drop bow pens, a drafting board, a tee square, distance measuring scales, triangles, a protractor, pencils, ruling pens, lettering pens, india ink, drafting paper and drafting tape. This free software replaces all of that expensive equipment and makes it easier to do precise drawings. The draftsman knew tricks to enable him to draw smooth curves that were far from simple arcs by carefully joining lines and arcs. The software tools presented here will enable you to draw such curves without learning the draftsman's tricks. The example below shows a smooth curve from point 1 to point 2 made of two arcs and a straight line. The drawings will start by positioning coordinates that establish the dimensions and proportions of what is to be drawn. Then the coordinates will be connected by drawing lines and smooth curves to draw the desired object. Most computers now have available software called Postscript or a Postscript clone called Ghostscript. This software allows the drawing of lines and arcs and alphanumeric characters. It does not include the advanced tricks of the draftsman. The drawing program presented here draws lines, arcs and characters using Ghostscript but adds tools to make the job easier. Computers can draw exotic mathematical curves. But practical drawing of objects long ago and in the present does not need such curves. Lines and arcs are sufficient. 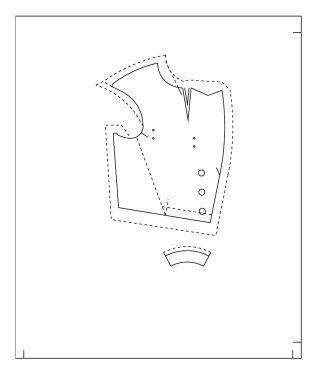 The procedures already in this program provide extensive tools for drawing with lines and arcs. But if you have a special application that requires a mathematical curve, there is nothing that would prevent you from adding a procedure for that purpose to this software. The source code of a basic drawing program including the software tools is presented. It is written in the Oberon-2 language and runs on the Debian linux operating system. This operating system can be added to the Windows operating system already on your hard drive. If you wish to use a different programming language and operating system you will have to do the work of translating it from Oberon-2 to the language of your choice. Whether you wish to use this program as it is or translate it to another language you will need to refer to the how to program a computer article found elsewhere at this website. The article explains Oberon-2 and adding Debian to Windows. From now on the source code of the program will be discussed. You will have to look at the source code. Portions of the source code enclosed between (* and *) are comments for you to read, and do not affect the execution of the program. Also, parts of the program that are not being used in the present configuration of the program are commented out. This is so that when the program is compiled the compiler will not warn that these parts are not being used. If these parts of the program are later to be used, they will have to be uncommented. Commenting and uncommenting to get clean compilations will be a significant part of the effort required to use this program. In the beginning of the program are global declarations. In the TYPE section of the declarations you can see the form of the coordinates, abbreviated as "coord". In the VAR section you can see that "cd" is an array of "coord". Below the declarations find "PROCEDURE setcoord" which serves to place a coordinate where you want it on the drawing. Immediately below that is the procedure "moveto". The first parameter "crd" is the number of the coordinate you will move to. The second parameter "md" chooses whether you will draw a straight line from your present position to the coordinate or move without drawing a line. Its possible values are "move" or "draw". The next procedure is "angle", which measures the angle of c2 from c1. Only positive angles are reported. The angles are measured counter clockwise from a horizontal direction pointing to the right. In most subsequent procedures that use angles only positive angles are acceptable. The angles must be in radians, not degrees. If you want to convert degrees to radians multiply the degrees by the constant "degtorad". If you want to convert radians to degrees multiply the radians by "radtodeg". If the procedure "angle" seems a bit complicated, it is because I wanted to avoid possible numerical difficulties by not using the function "arctan" beyond 45 degrees. The next procedure "distance" uses the Pythagorean theorem to calculate the distance between two coordinates. The procedure "newcoord" allows you to position a second coordinate at an angle and distance from the first coordinate. The procedure "midpoint" allows you to position a third coordinate a specified fraction of the way along a straight line between two coordinates. We will ignore the procedure "mirror" because it is used by other procedures, and we will not normally use it ourselves. The procedure "rotate" finds a new coordinate "nc" that is a result of rotating "oc" by an angle "dth" about center point "ctr". The angle dth is not an absolute angle, but a change from the original angle from ctr to oc. The procedure "intersect" finds the intersection of two straight lines defined by four coordinates. The intersection is found even if the lines are too short to reach the intersection. The procedure "tangentarc" requires some explanation. We start with coordinates p1, p2 and "ofst". If an arc starts at ofst at angle ang, it will be tangent to a line p1-p2 only if the radius is chosen properly. Tangentarc finds the point on line p1-p2 where an arc with the right radius would be tangent to p1-p2. You do not have to specify the correct radius. The procedure does not draw the arc, it only finds the tangent point. The procedure "circle" is primarily to draw small circles at coordinate locations to make the locations visible in the drawing. But circle could be used to draw a large circle if you need one. Now skip down to procedure "ntrsctarc". It finds the first intersection of a line with an arc. The result is the coordinate "i1" in the parameter list. The procedure "ntrsct2arc" finds the two intersection points of two overlapping circles. The intersection coordinates are not in the parameter list. They are the temporary coordinates "ntrsct1" and "ntrsct2". You can use the label command to plot your figure and see which is which. Then if you want one of the two assigned to a coordinate number of your choice, you would do so with a statement such as "cd:=cd[ntrsct2]". The next time you use ntrsct2arc the coordinate ntrsct2 will refer to a different location than it did before. Procedure "reflect" uses line o1,o2 like a door hinge to fold line c1,c2 over o1,o2 to create line r1,r2. Procedure "shiftright" shifts the coordinates of a line to form coordinates of a new line. Procedure "tangentline" finds a point on a circle where a line from coordinate "ofst" outside of the circle would be tangent to the circle. This is the end of the list of procedures that place or find coordinates. Below will be different kinds of curves drawn in the procedure "test". The first part of test is the same for all examples. Only the code that computed each example will be reproduced here just before the curve is shown. In each example the procedure "label" is called. It prints the number of the coordinate. The second parameter of label indicates where the number will be printed in relation to the location of the coordinate. The choices are 0 through 7. O prints the number to the right of the coordinate. Each higher number represents locations in 45 degree increments ccw around the coordinate. The procedure "arc" draws an arc through two or three of the points c1,c2,c3. Read the comment paragraph in the procedure for more details. Below is an example. The procedure "arcline" draws an arc starting at c1 at an angle ang1. At a fraction "frac" of the distance from c1 to c2 the arc ends and a line goes the rest of the way to c2. Since both ang1 and frac can be changed, this procedure can produce a wide variety of curves. In the example below frac is 0.5. If frac were 0.01 the arc would disappear and the result would be a line from c1 to c2. If frac were 0.99 the result would be like the arcang example above. The procedure "midarc" draws a smooth curve through three points. The curve consists of two lines and an arc. The fraction "f" determines the size of the arc. If "f" is 0.01 the arc has almost zero radius and disappears. If "f" is 0.99 the arc is as large as it can be and almost reaches the outer point closest to the center point. One of the lines disappears. In the example f is 0.7. 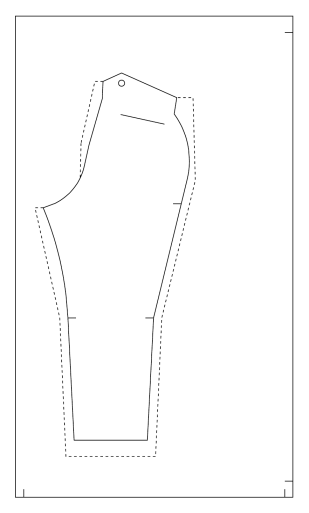 The procedure "sline" makes "S" shaped curves. It connects two points with a smooth curve consisting of two arcs and a line. The angle that each arc leaves its point and the radius of each arc is adjustable, giving lots of freedom in shaping the curve. If you make the radii of the arcs so large that the straight line portion goes to zero, the program will crash. Also, the curves must bend to make an "S", not a "C". Since all of the above curve procedures leave you with knowledge of the angle of the ends of the curve, you can smoothly extend the curve. Postscript provides another curve besides arcs, namely Bezier curves. In my experience you can waist a lot of time getting a Bezier curve to do what you want. I strongly recommend not using Bezier curves. With the curves provided here you should get a good enough curve with less waisted time. Bezier curves will change in a less predictable manner if you change the proportions of your drawing by changing the input data file. While some of the procedures included here may eliminate some of the geometric construction that would otherwize be necessary, some geometric construction will probably be required in most drawings. Old fashioned mechanical drafting tools were typically used for geometric construction of drawings. This involved finding points where lines and or arcs intersected. The tools provided here are adequate for geometric construction. Repeatedly during the construction you will want to display your partially completed drawing on the screen. Below is a figure that was drawn with geometric construction. The procedure that produced this figure using the tools presented here follows. Any x,y coordinate graphic system must have an origin and scale. The origin of the postscript graphics is the lower left corner of the page. The scale is such that 72 postscript units represents one inch on the page. But that scale and origin is not likely to represent the requirements of your project. The scale and origin used in this program is what I needed for my last project. You can change the scale and origin to match the requirements of your project. In my project I was using an example in a book. In the example the origin was the upper left of the figure. The units were inches. The figure would be much larger than printed in the book. It would have to be printed on a large printer at a graphics shop. But I also needed to print the figure at small size so I could print it on my computer printer. In the global declarations at the beginning of the program you can find xcorg and ycorg representing the origins for small scale printing, and xcorgl and ycorgl representing the origins for large scale printing. At the beginning of the procedure "getdata" the user chooses between large scale and small scale. At that point the value of the variable "scale" is set according to the choice made. You want user coordinates to be in user units. These might be inches, centimeters, meters, yards, miles or kilometers. In the sample program the large scale is 72. Since postscript has 72 units per inch, this means the a user unit of one represents one inch on the page. The small scale is 11.18. This means that one user unit is only 11.18/72=0.155 inches on the page. That is useful so a figure that would require a large printer could be printed on a small printer or could be viewed on the computer screen. You want the user origin wherever you choose it to be in your drawing. It could be in the center, one of the four corners, or anywhere else you choose. If your program will draw several objects, like the illustrations at the beginning of this article, you may want the origin to be different for the different objects. If so you would declare different origins for different objects. You would declare origins in user units. Since the postscript origin is in the lower left corner, your user origins would be specified in user units relative to the lower left. In the program "xcorg" and "ycorg" are the coordinates of the user origin specified relative to the lower left in user sized units. After you draw an object with the origin of your choice, you may want to print out multiple objects on the same page. To do that you will need to shift the origin of an object that has already been specified by a procedure. That is done by the variables "dxorg" and "dyorg". The first figure in this article has four items in the same drawing shifted to convenient locations by this method. The shifts were specified in "batchproc" which put out all the figures at one time. The figures were put out in the form of pdf files. The command in the border1 procedure "xorg:=xcorg*scale;" converts the origin in user units to postscript units. If you want your figure printed out on a large printer at a commercial shop you will have to have a rectangular border around it. This tells the printer how to automatically cut out the paper. In the procedures "lid" and "lidsize" the command "xorg:=(xcorg+dxorg)*scale; shifts the origin and converts it to postscript units. The border will not be shifted, put objects within the border can be shifted. The array of coordinates "cd", is in user units. The drawing must actually be done in postscript units, not user units. The command "moveto" takes in user units and puts out postscript units as do all the procedures that actually draw on the page. The other procedures take in and put out only user units. Then use the program and choose the large scale. Draw the test example. 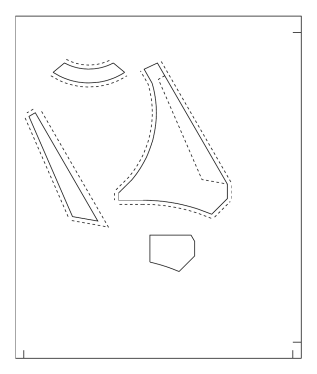 You will get a large triangle that can be printed on 8.5 by 11 paper using the original Postscript origin and scale. You can use the vi editor to examine the file "temp1" and see the Postscript file that is plotted. When through with this example be sure to set origin and scale values back to what they were because the examples depend on it. Your printer will probably not allow you to print closer to the edge of the paper than a quarter inch, even though the Postscript coordinate system goes all the way to the edge of the paper. The drawings can be labled with alphabetic characters. The font size is determined by the constant "fontsize" in the program. Most computer fonts are scaleable. The postscript command that selects the font you want also specifies the size you want the font to be. Font height is in postscript units of 1/72 inch. The size of fonts in your drawing is not scaled by the scale factor that scales the size of the drawing. You can used different font sizes in different parts of your drawing by initilizing the font in different places in your program. If you search for the word "fontsize" you can see the various places in the program where the font is initialized. If you want to see what other fonts are available for you to use then in a terminal window execute the command "gnome-font-viewer". The procedure "label" can be called to label any coordinate. It is assumed that you have read the article "how to program a computer" at this website at least up to the part about how to compile and run a program. Also you should have read the articles at this website "how to use the linux terminal" and "how to use the vi editor in linux". You could use the vi editor to write the program in this html article as a text file. But text is different from html. Some of the lines in the text file will have the & character. These lines will have to be changed. When viewing these lines in the text file with the vi editor the lines should look the same as when viewing the html version in your browser. Once these lines have been fixed, if the program is moved to the "src" directory, the program can be compiled with the command "oocm curve". This command will be executed from the directory "prog" above the directory "src". In the trivial example we are using only two numbers are needed in the data file. If we were drawing something more complicated several numbers might be required. The name "john smith" may not be needed for your application. Its purpose is if you wish to use the same program to send different drawings to different people where each person sends you a different data file to use in the program. In the example the lines that start with ---> were entered by the user. The rest were responses by the program. The plot would be displayed on the screen during this process. The plot is a trivial example of a plot, the lid for a box. The dashed lines at the edge of the lid are the parts of the lid that are to be folded down over the edge of the box. 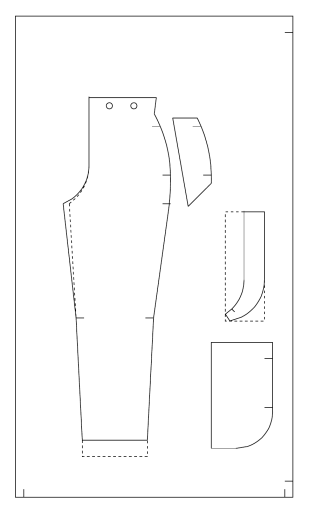 The folded parts are referred to as inlays in the program. A large rectangular border is drawn around the lid. The purpose of this border is for use when the picture is drawn at large scale to be plotted on a large plotter at a graphics shop. The large plotter requires a rectangular border so it can automatically cut the paper about a half inch beyond the border. Large plotters are good, but not perfect. If your border is 50 inches long, the error may be a half inch. The program only draws one item, a lid. Your program may need to draw several items. The drawings are normally written in ps format, or Postscript format. But if you select the command batch, they will be drawn in pdf format. The large plotters in graphics shops require pdf format. The procedure batchproc in the program can be expanded to draw all the different items you wish to draw. | pnmscale 0.6 | pnmtopng > "$newname"
You can change the name "temp1.png" to "newname.png" with the command "mv temp1.png newname.png". The statement In.Line(dummy); is needed to remove the invisible newline character left over in the input buffer from the In.LongInt statement. The program would crash without this statement if you were to modify the program to eliminate the input data file. In the example in this program the procedure lidsize computes the main coordinates that define the figure. 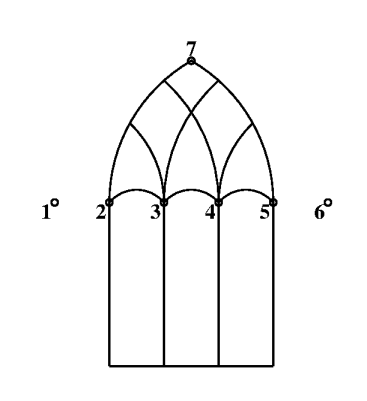 In a more complicated example such a procedure might compute the coordinates of a complicated structure that would be broken into several figures. The procedure lid actually draws the figure. In a more complicated example several such procedures might separately draw pieces of a complicated figure. In the procedure lid the first two lines after "IF inlays" change the mode of drawing to dashed lines. The last two lines of that section turn off the dashed line mode. Foundation, version 3 of the License. (*new coord at angle and distance from old coord. of two straight lines, p11 to p12, and p21 to p22. average of 0 and 1.5*pi is 1.75*pi, not 0.75*pi. arccenter, th1, th2 will be useable after invocation. to the right a distance s from the coordinates c1,c2.